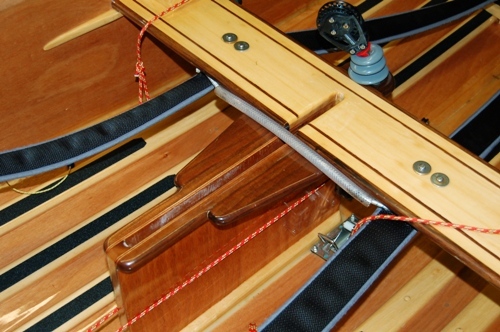 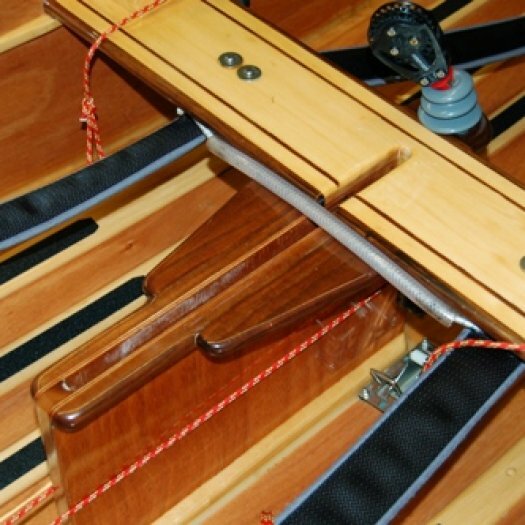 You can simply lash a block to the daggerboard case with a bit of line running around the case under the capping. 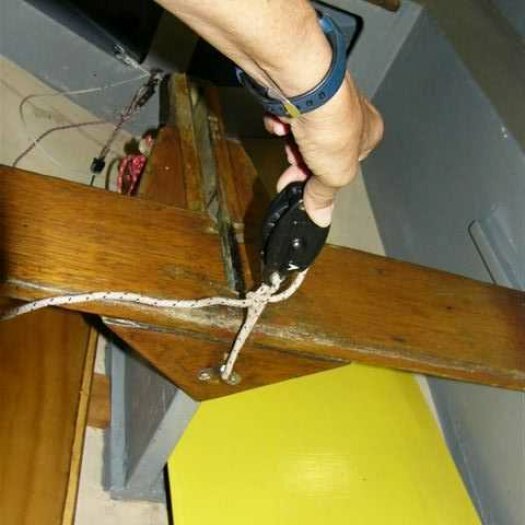 You need about 1620mm of of 3mm or 4mm line to do this. 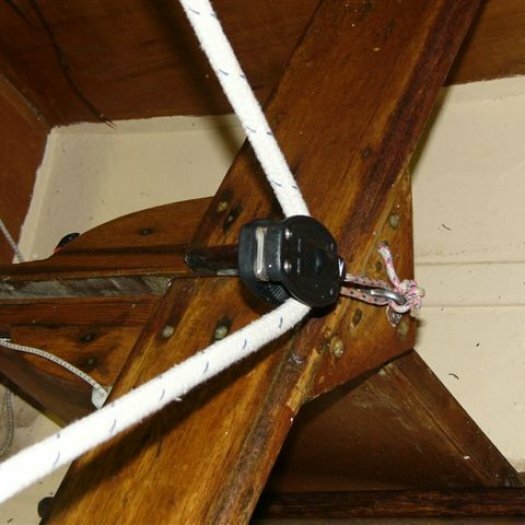 Another simple method is to just to attach a deck clip (lacing eye) on the centre of the thwart and attach the mainsheet block to this. 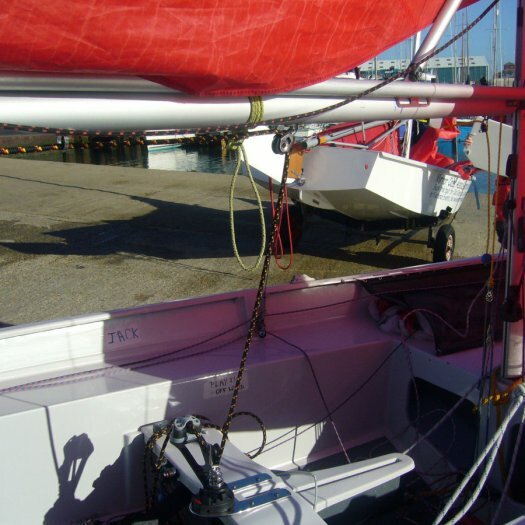 This position has the disadvantage of further restricting the space available for the crew between the mainsheet and the kicking strap. 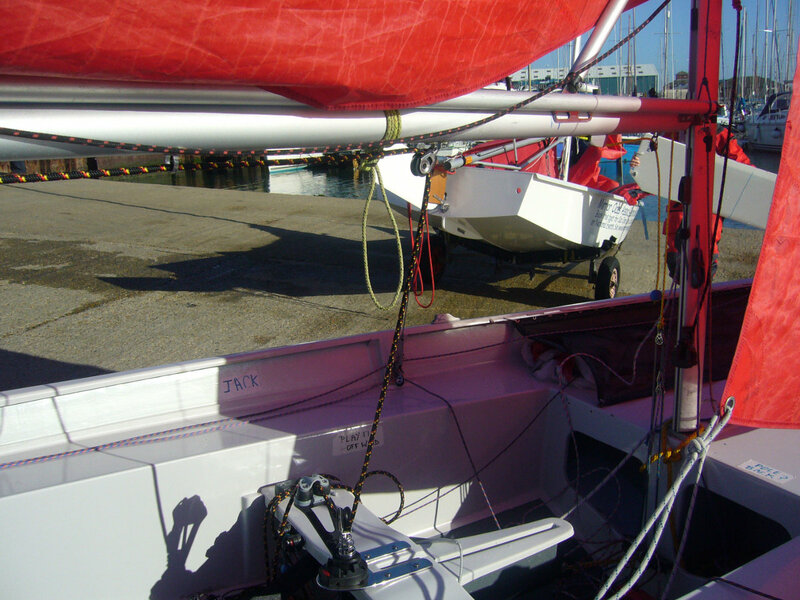 There is not enough room to mount a mainsheet block swivel stand up base or a mainsheet block and swivel jamb cleat in this manner. 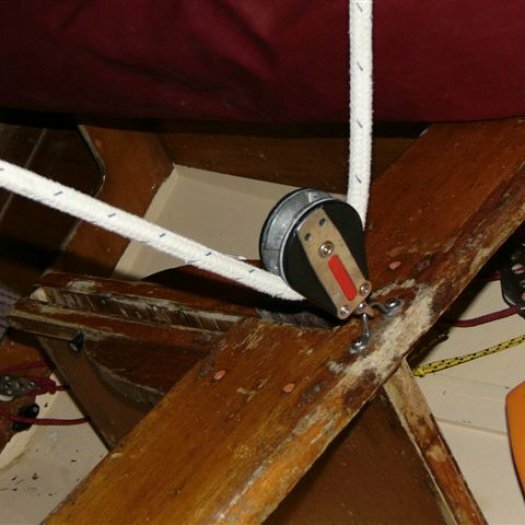 A disadvantage of this method is that the fixings are in tension, so a risk screws will pull out of the thwart. 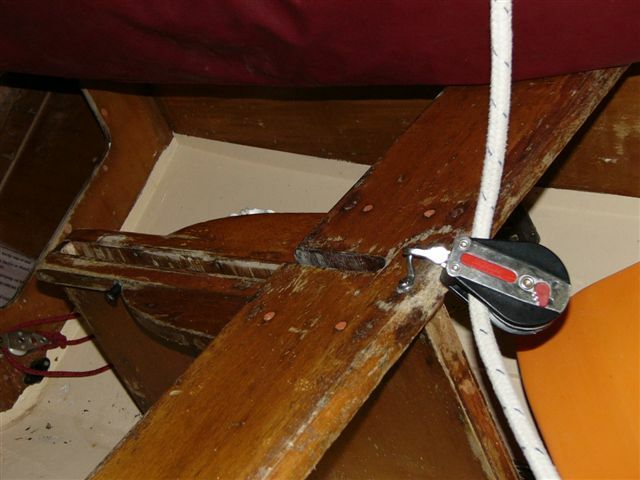 If the deck clip is bolted on (following Celia's Law), they should be fine. 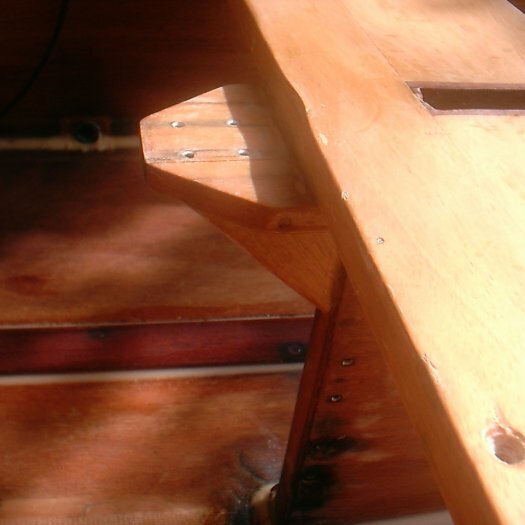 A mounting block of wood etc. 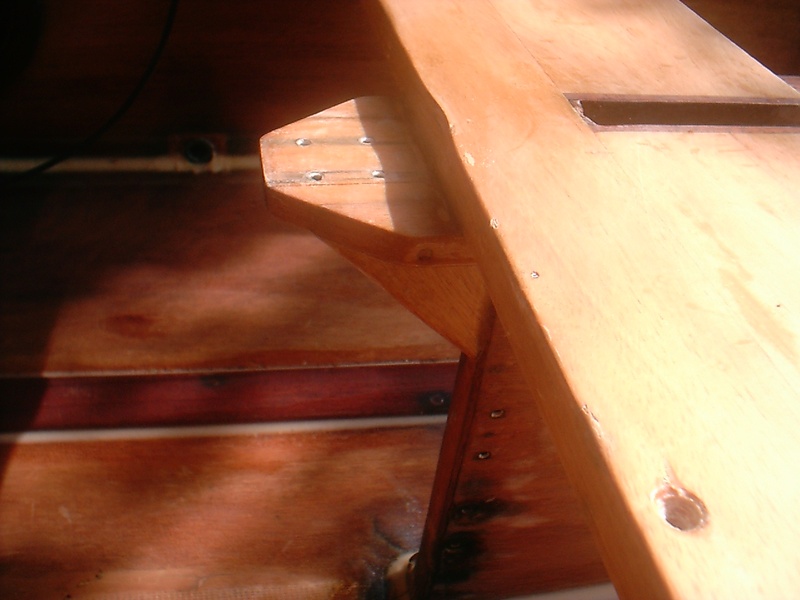 can be glued under the aft edge of the thwart with a glue join to the aft edge of the daggerboard case. 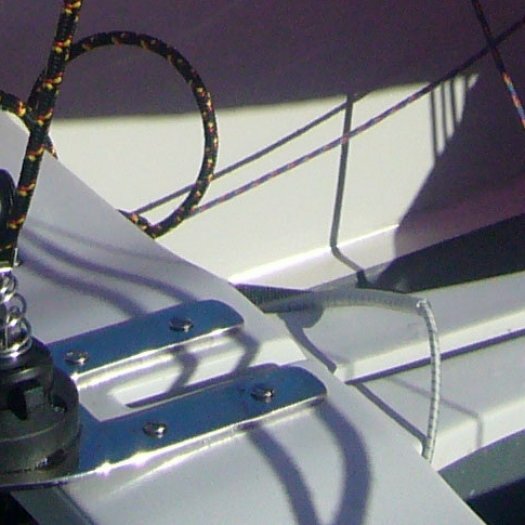 This gives a vertical face which the deck clip can be mounted on. 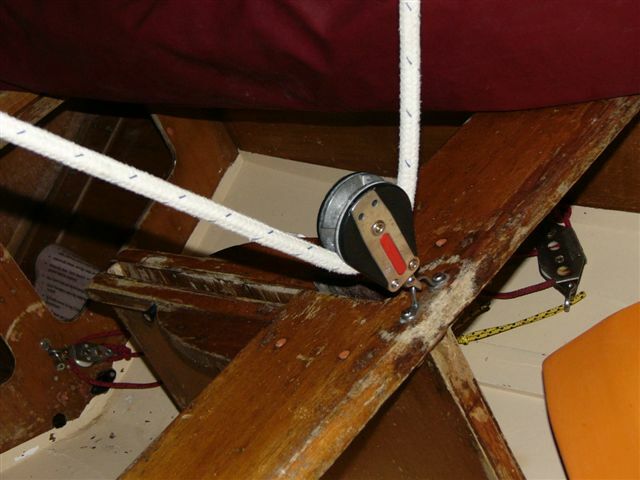 It's not a suitable method to mount a mainsheet block swivel stand up base or a mainsheet swivel jamb cleat. 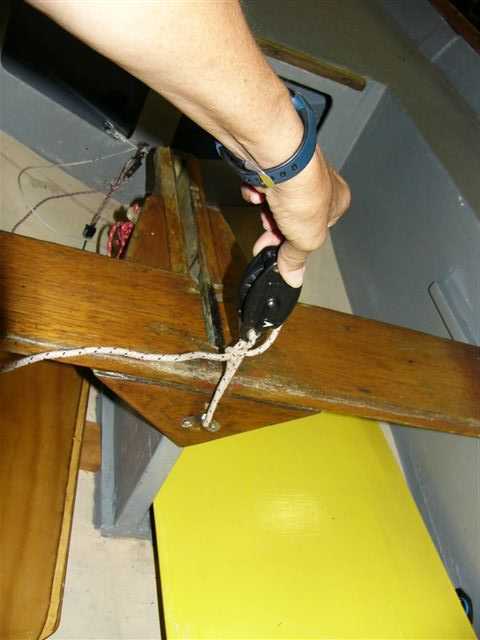 A metal plate which extends aft of the thwart can be screwed to the top of the thwart. 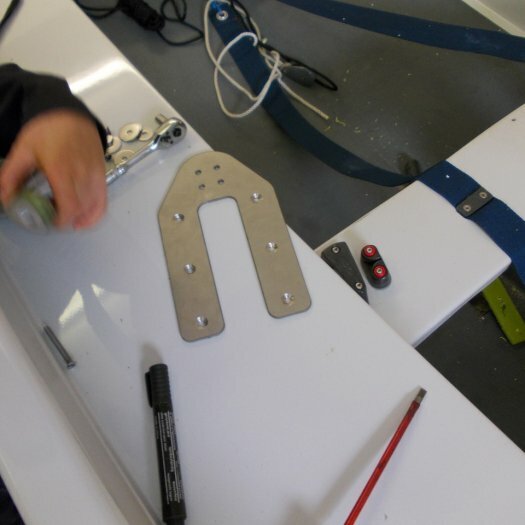 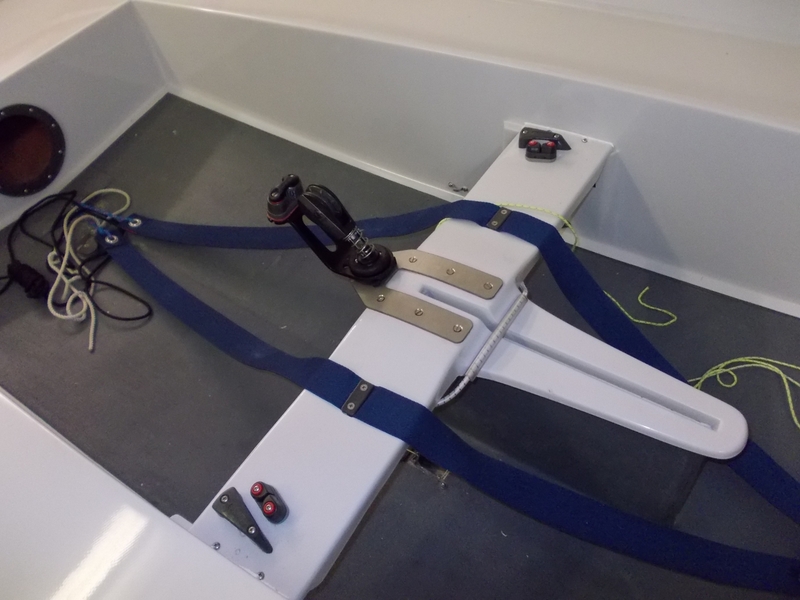 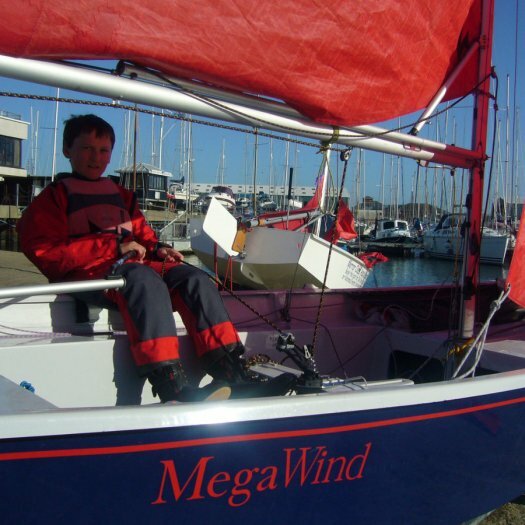 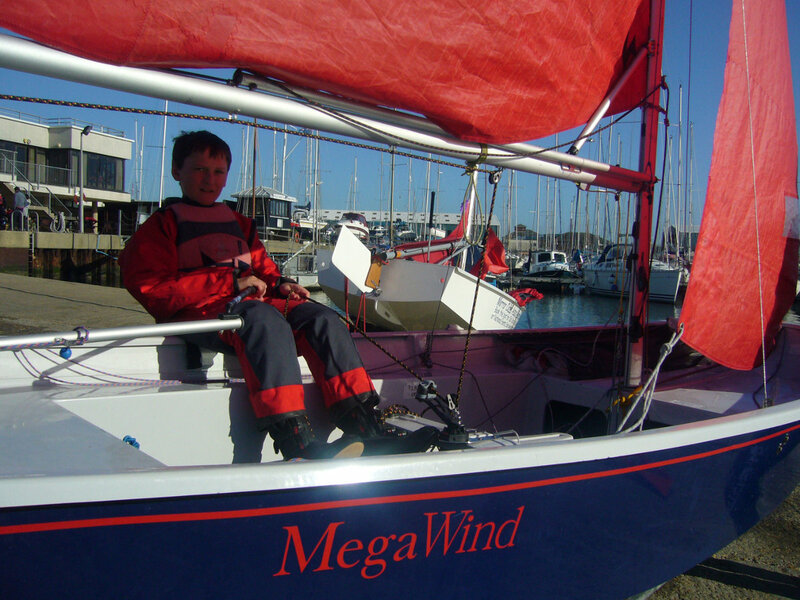 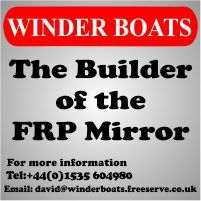 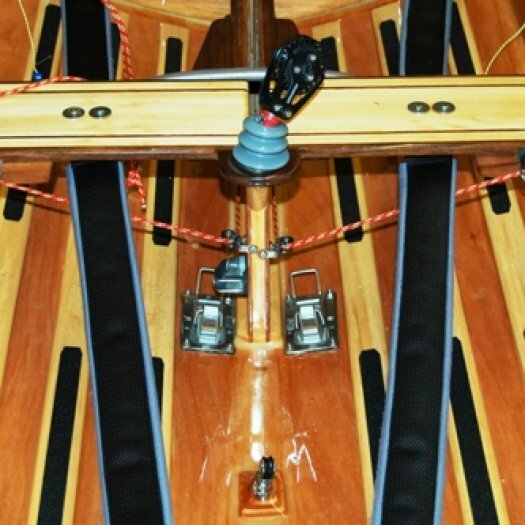 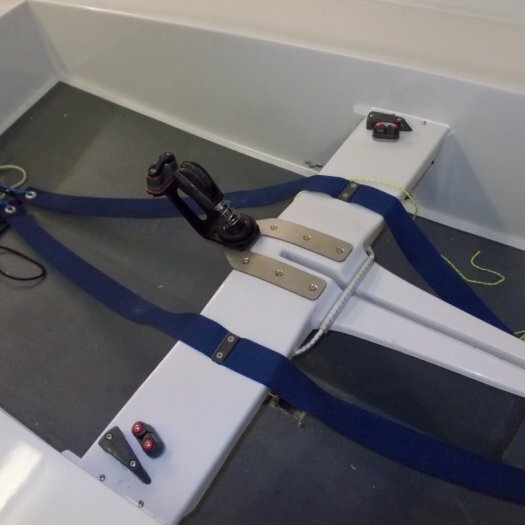 UK mast manufacturer Superspars sell such a mounting plate shown here on 70500 - Mega Wind (though variations in thwart design between wooden and GRP boats made it hard to standardize - they had two in stock in April 2014). 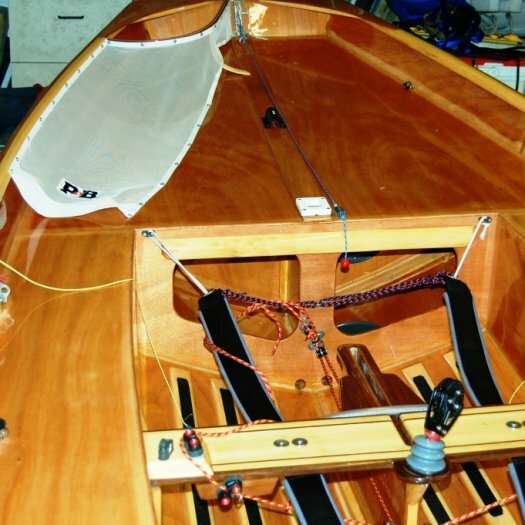 Or they can be fabricated from scratch as shown here on 70492 - The Black Pearl. 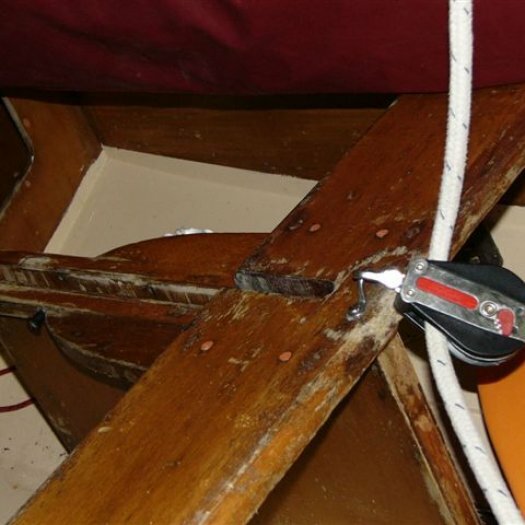 Needless to say the plate needs to be strong enough to not bend under the loads imposed on it. 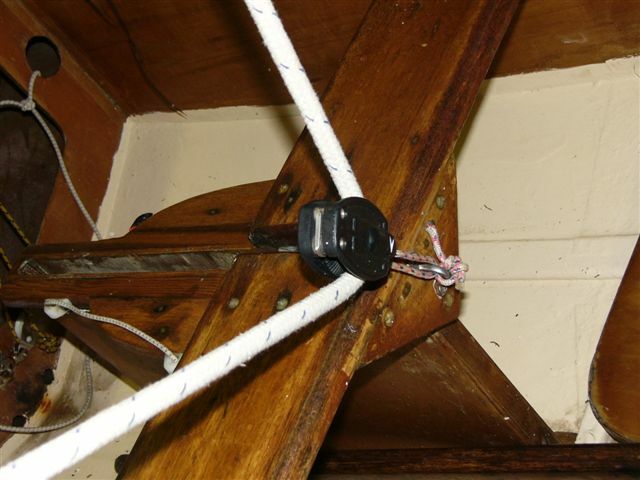 This gives a suitable platform for any swivel fitting you might wish to use. 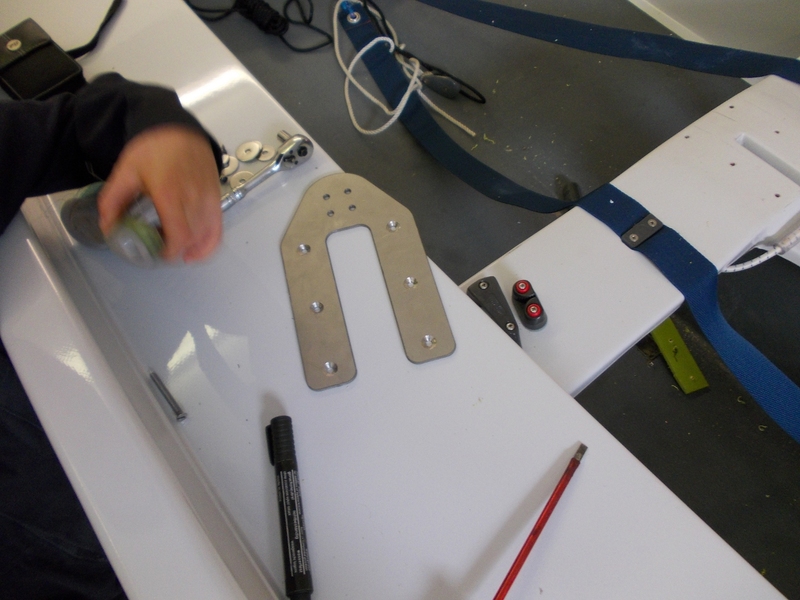 The one above was designed by Steve Lenney to take a Harken swivel cleat and fabricated from 3mm stainless plate by a Falmouth company Fibre Fusion using a CNC water jet cutter. 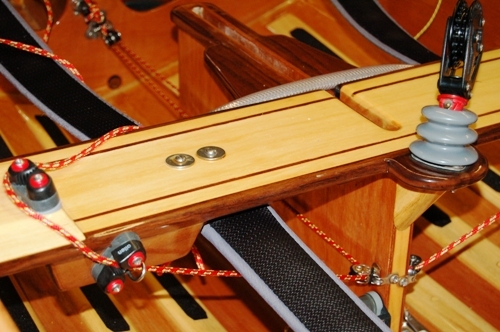 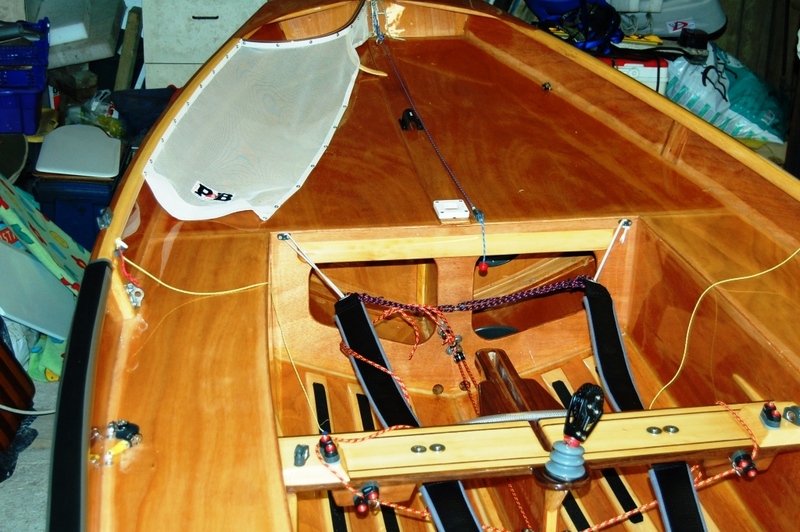 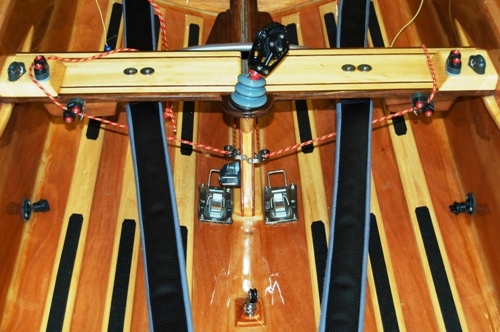 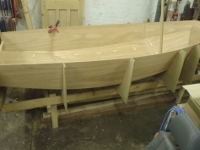 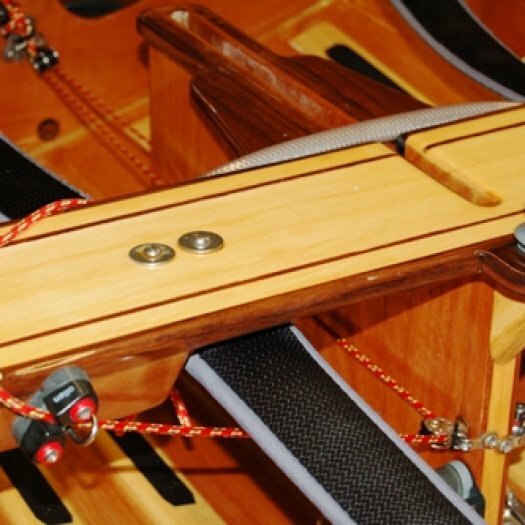 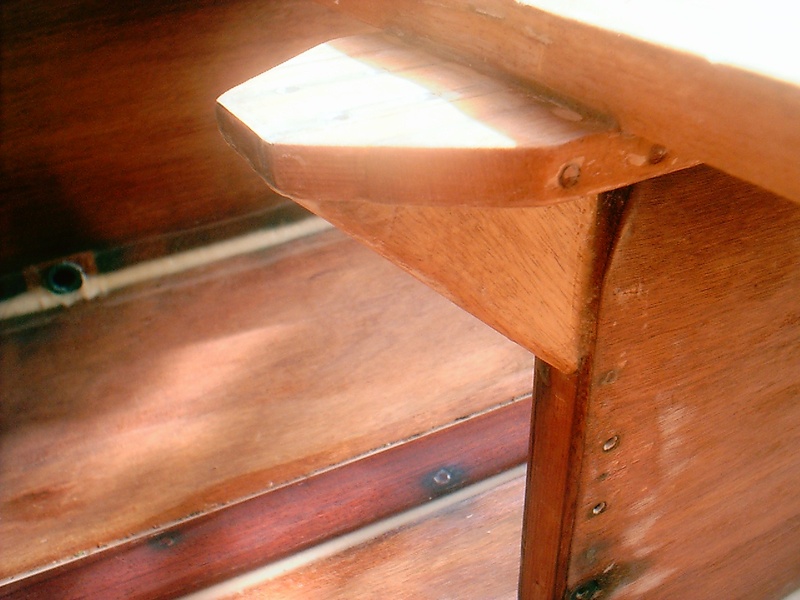 A horizontal mounting platform extending aft of the thwart can be fabricated from wood etc. 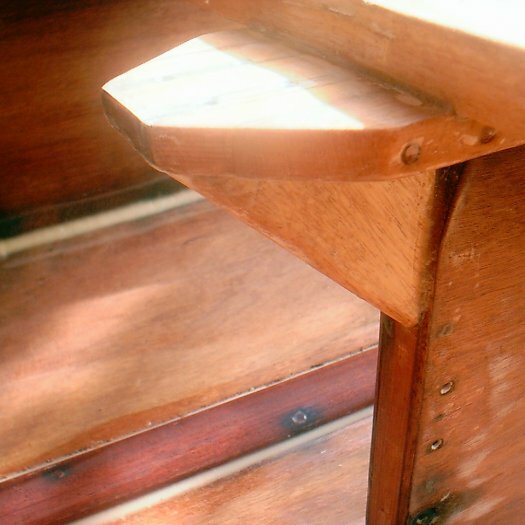 This is glued under the back edge of the thwart and experience shows a knee glued to the aft edge of the daggerboard case is needed.